Prime Minister Narendra Modi is the third most followed leader on Twitter after US President Donald Trump and Pope Francis, a global study said today. With over 42 million followers on his personal Twitter account, Prime Minister Modi is behind US President Donald Trump (52 million) and Pope Francis (47 million) but in terms of influence on the microblogging site, Mr.Modi is the second most important world leader, according to the 2018 “Twiplomacy” study by Burson Cohn & Wolfe (BCW)– a global communications agency. Mr. Modi’s institutional account @PMOIndia occupies fourth spot with over 26 million followers and outranks official Twitter account of the US President, @POTUS ranks fifth and @WhiteHouse ranks sixth, with over 23 million and 17 million followers respectively as per the study. With 52 million interactions over the past 12 months, Mr.Modi stands to be the second most influential leader in the world after US President Donal Trump. 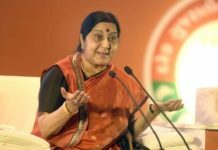 With over 11 million followers, India’s external affairs minister Sushma Swaraj is not only the most followed female world leader but also the most followed foreign minister in the world, study said. The heads of state and government and foreign ministers of 187 countries had a presence on Twitter, representing 97% of all 193 UN member states, the findings showed. Facebook, the second most popular platform among government leaders followed by Instagram.